1. If you can get arrested for hunting or fishing without a license, but not for being in the country illegally, … you might live in a country founded by geniuses but run by idiots. 2. If you have to get your parents permission to go on a field trip or take an aspirin in school, but not to get an abortion, … you might live in a country founded by geniuses but run by idiots. 3. If you have to show identification to board an airplane, cash a check, buy liquor, or check out a library book, but not to vote, … you might live in a country founded by geniuses but run by idiots. 4. If the government wants to ban stable, law-abiding citizens from owning gun magazines with more than ten rounds, but gives 20 F-16 fighter jets to the crazy new leaders in Egypt, … you might live in a country founded by geniuses but run by idiots. 5. If, in our largest city, you can buy “two” 16-ounce sodas, but not a 24-ounce soda because 24-ounces of a sugary drink might make you fat, … you might live in a country founded by geniuses but run by idiots. 6. If an 80 year old woman and 3 year old child can be stripped searched by the TSA, but a woman in a hijab is only subject to having her neck and head searched, … you might live in a country founded by geniuses but run by idiots. 7. 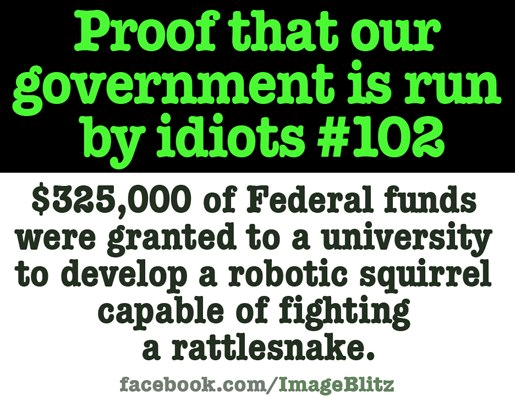 If your government believes that the best way to eradicate trillions of dollars of debt is to spend trillions more, … you might live in a country founded by geniuses but run by idiots. 8. If a seven year old boy can be thrown out of school for saying his teacher is cute, but hosting a sexual exploration or diversity class in grade school is perfectly acceptable, … you might live in a country founded by geniuses but run by idiots. 9. If children are forcibly removed from parents who discipline them with spankings while children of addicts are left in filth and drug infested homes, … you might live in a country founded by geniuses but run by idiots. 10. 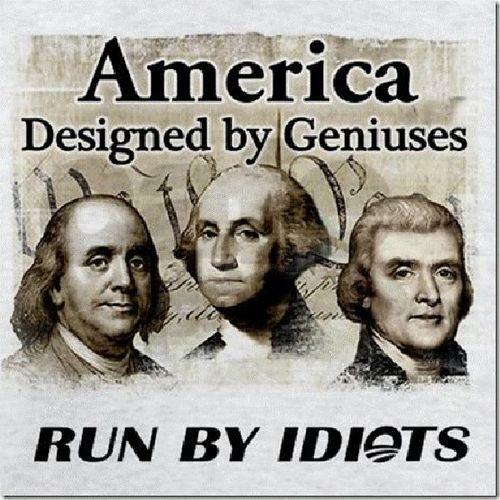 If hard work and success are met with higher taxes and more government intrusion, while not working is rewarded with EBT cards, WIC checks, Medicaid, subsidized housing, and free cell phones, … you might live in a country founded by geniuses but run by idiots. 11. If you pay your mortgage faithfully, denying yourself the newest big screen TV while your neighbor buys iPhones, TVs and new cars, and the government forgives his debt when he defaults on his mortgage, … you might live in a country founded by geniuses but run by idiots. 12. If being stripped of the ability to defend yourself makes you more safe according to the government, … you might live in a country founded by geniuses but run by idiots. #4 – Why does everyone thinks government wants to ban guns when, the truest essence of gun control is to regulate it and NOT take guns away? This is a problem we have in this country, No one is taking your guns the initiative is to regulate gun usage, types of weapons to use and where to use it. Only the idiots who think they’re taking their guns away are the fools. Innocent people are being shot daily in this country and why? We can only surmise til we regulate the use of gun control and NOT take them away unless you’re using these weapons for another reason. #10 – Why isn’t anyone talking about “Corporate Welfare”? You complain about a mediocre government budget spending to restore the safety designed, and built the millions of struggling Americans when, the true thieves are “Corporate Welfare” case and point; Government program “Welfare” cost tax payers less than $39 Billion annually, while “Corporate Welfare” cost tax payers $83+ Billion annually. You might want to retract your statement unless you’re “Republican” then, we have a problem. Cost expenditures to secure “Corporate America” and how they’re costing tax payers nearly 2 and a half times more towards “Corporate Tax Subsidies” than programs, designed as a safety net for struggling American families. Only an idiot would inscribe a testament to degrade struggling Americans while, protecting “Corporate Welfare” who gives nothing back to the people yet, they’re profiting $Billion$ annually on the backs of “Struggling American tax payers”. Do your math and quit trashing struggling American families while, the (R) and some (D) are pushing to secure “Corporate Welfare” paid for by Struggling Americans. If anything we should be trashing those who are the true welfare recipient, “Corporate Welfare” this is where “Tax Revenues” needs to increase on the Rich, Wealthy and Corporations after all, we’re losing money and if money is what we need then lets, increase the taxes where our economy is needed. Legalize Marijuana = More Tax Revenue, increase taxes on the Rich, Wealthy and Corporations who pays nearly nothing towards taxes is additional Revenue needed towards our economy. It is apparent we need change in this country and, certain parties in Congress needs to act or be removed case and point; John Boehner has been talking about job creation yet, House Republicans fail to create one jobs bill and, they’re failing to extend unemployment benefits to those struggling Americans including, benefits towards our struggling military service men and women another also, they were so quick to trash this administration during the “Government Shutdown” they created themselves. Now these 12 simple statements proves one thing, our bureaucrats are spending spending too much time, doing nothing for and towards the benefit of the people of this, once great nation and its time for a change. It’s time for “We The People” as our forefathers implemented while formulating the US Constitution. Something to think about unless, you are a Republican. You can’t make bad things go away by pretending they don’t exist and the problems lies with our Bureaucrats, all of them. The undertone is still Republican bashing. All these guys are in someone’s pocket. Since our pockets are empty, it ain’t us. My Lord! When you put it all together…they sound like total mentally ill idiots!